When it comes to weddings there are a few traditions that the majority of people still adhere to. One of the most common ones of course is the colour the bride wears. These days it does vary somewhat, with brides choosing one of 1000s of shades between a stark white and a buttery cream or a soft pink etc. Guests of a wedding can really wear whatever they fancy whether they choose bright colours, pastels or patterns. The older generations wouldn’t dream of wearing black to a wedding, or on the flip side, risk overshadowing the bride by wearing white. Oh, how things have changed. These days the rule book certainly has been thrown out, and people are making choices based on their own tastes, irrespective of tradition. 25 year old, Melbourne based mummy blogger Sophie Cahcia made headlines for wearing black to her own wedding. Cahcia wore a stunning long sleeved gown with fishtail, lace sleeves and a choker. Her bridesmaids also wore black, and her hubby-to-be chose to wear a red blazer teamed with leather pants. They had chosen to dress for themselves, rather than follow tradition. And why not? Her bouquet was a wild blend of greenery and berries featuring a rich and dramatic blend of reds and magenta. 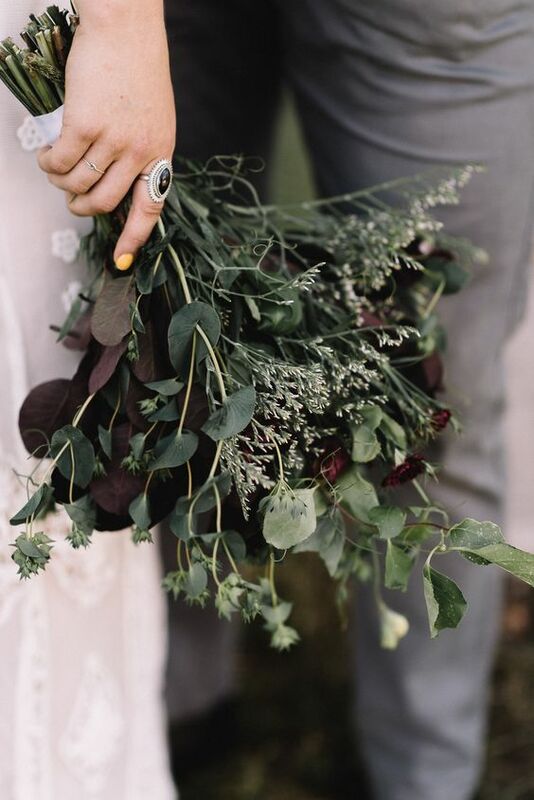 Her bridesmaids carried bouquets made entirely from greenery, and berries. 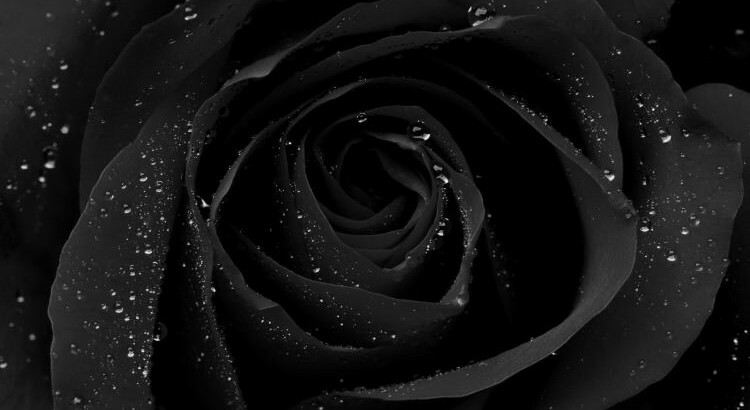 In that way, it was a little reminiscent of Mortisha Adams, almost as it the rose blooms had been snipped off the bouquet one by one. Bouquets of greenery can be so interesting because there are so many different foliages out there. We are not talking about a bunch of Camellia leaves tied with a bow, oh no! 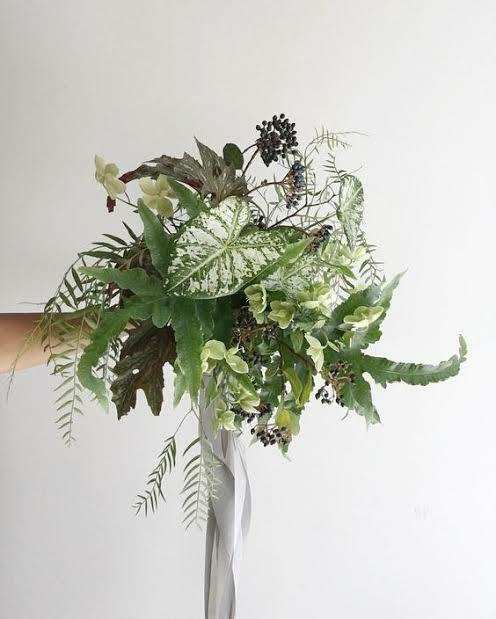 Gorgeous flat tropical leaves such as philodendrons, and monsteras, heads of cordylines, or dracenas, tendrils of peppercorn berries, or asparagus fern… Add to that the array of bromeliads, or succulents that can add both colour and texture to your bouquet. 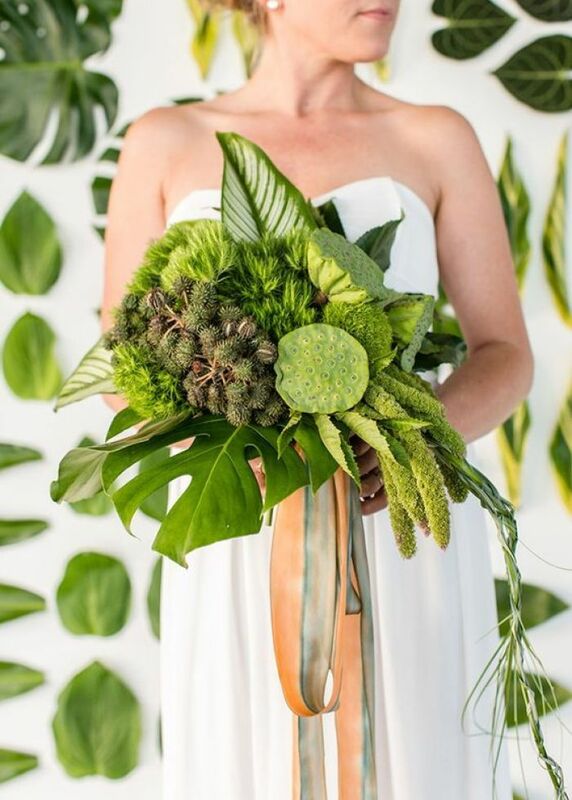 And remember, by choosing to have a bouquet of greenery, you are not limited to the colour GREEN! 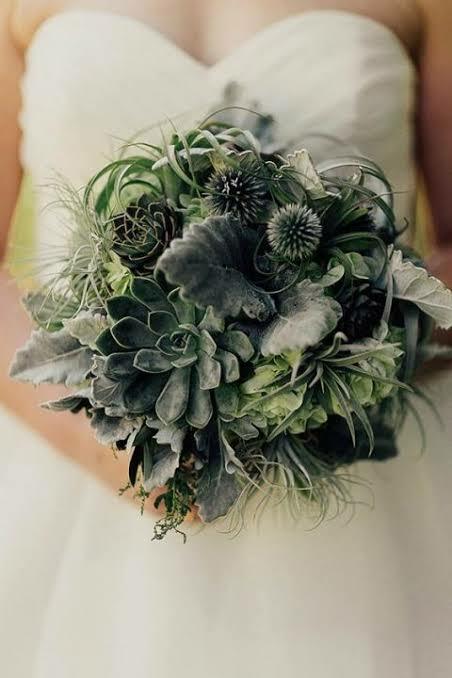 So, what do you think about a bouquet that uses no ‘traditional’ flowers? Is that something that you would consider for your big day, or do you think it’s too risky to turn up with something that isn’t traditionally ‘pretty’? If you are currently planning a wedding, or know someone who is, get in touch with our friendly staff on 02) 98711666 or browse our wedding gallery. Love to hear your thoughts on any traditions you would consider compromising, or traditions that are non negotiable for you.